“It is no coincidence that in no known language does the phrase ‘As pretty as an airport’ appear.” Douglas Adams. I hate wearing sunglasses. I have an oddly shaped head or face or something, because they always make me look very strange. Like a beetle on crack. I’ve tried every type from teeny-weeny intellectual ones to motorcycle cop “you-can’t-see-my-eyes” styles to the ones with lenses the size of garage doors. None of them give me that sophisticated Jackie-O look–no matter how many scarves I wear. And they make my eyes sweat. Well, not my actual eyes–that would probably land me a spot in some optical medical journal–but the space under my eyes. All summer I look like Alice Cooper. I realize that I could invest in some waterproof mascara, but that just opens up a whole new can of worms. My husband’s glasses fog up a lot. That must be frustrating. One minute the world is a crisp vision of loveliness and “pwoff,” it is transformed into a chasm of blurriness (do you like my attempt at Mad Magazine–ish sound effects?) Which raises another question? Do contact lenses ever fog up? Or worse, if they get cold can they stick to your nice, warm eyeballs? 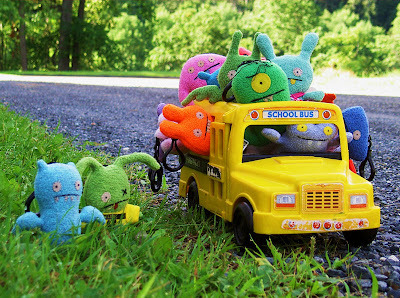 Think of Flick’s tongue and the flagpole in The Christmas Story. 1) I have recently discovered that I am an idiot. Seriously, I am a total numpty-head. I don’t know how many times I have endured the frustration of pulling out a sheet of Saran wrap, having the entire tube come with it, and struggling to hold on to my sheet of cellophane without allowing it to stick to itself, while I fight to return the roll to the box. A box with a jagged metal “tearing strip” that usually winds up ripping my flesh during this battle. It happens to me on a regular basis. And I always blame the Saran wrap. Or its equally frustrating cousin, tin foil. It turns out that I am to blame. Apparently, the thoughtful manufacturers of these products have gone to the trouble of creating a device to keep these rolls in place. I’m just too stupid to read the packaging and make this discovery. If you, too, are a moron–I’m in no position to judge your mental prowess–simply take a glance at the photo to your right. 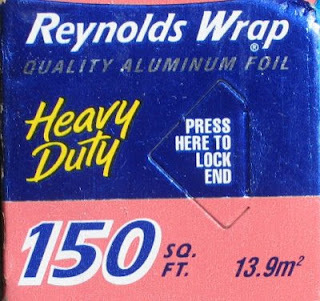 See the little triangular-ish shape on the side of this (and all other) Reynolds Wrap boxes? Well, apparently, if you push that puppy in, the roll will stay in place. Who knew? Okay, some of the world’s “smarty-panted” people probably knew. But, surely I can’t be the only one who didn’t know. Could I? (Cue sound of crickets). 2) I love trees. My favourite is the weeping willow. They’re great for climbing and their long, draping foliage is perfect for hiding in. Maples are nice too. Seriously, a tree that makes pretty colours in the fall AND gives us sweet sap for pouring on our pancakes. Plus, I’m Canadian. Maples are sort of our thing. Check out our flag. And our pennies. Although you’ll have to check out the pennies soon since they have been put on the minting chopping block. I recently discovered, however, that not all trees are pretty or stately or eager to provide us with shade. Some are downright scary. 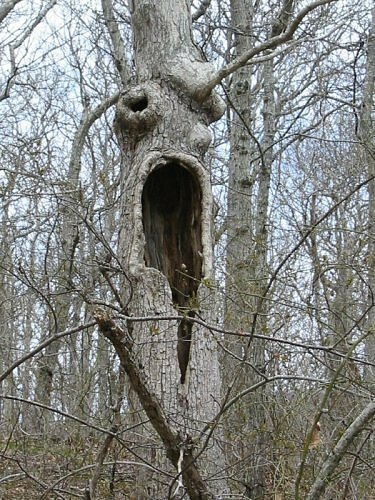 This “screaming tree” lives in Hither Hills State Park, NY. I’m sorry, but if I ran in to this, I’d probably run the other way screaming. Trees just simply aren’t supposed to look like this. I am grateful that a very brave photographer managed to take this shot though. Seriously. Can you imagine seeing this through a camera lens? Or taking your eyes off it long enough to take your camera out and turn it on? I’d be far too worried about what its branches were up to. Like, are they reaching around to grab me? I mean look at the mouth! 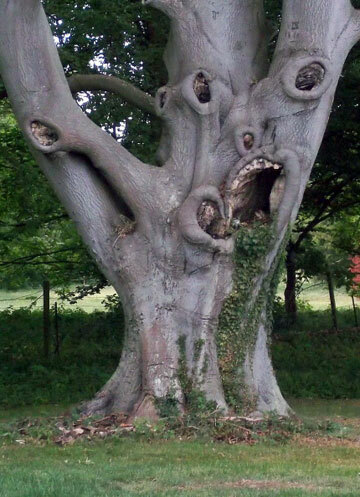 Trees generally don’t have mouths. I can only imagine what someone would find if they peered down inside this bark-covered beast. But, as ugly as the American offering is, the UK has an even more horrific forest dweller. Not only does it have teeth, but it appears to have actual eyeballs. Or eye sockets, at the very least. Does anyone remember the evil trees in H.R. Pufnstuf? In case you don’t, you can catch them here…. I think I’ll go outside and hug my faceless oak. 3) I have simply got to go to Japan. As you know, this is the land of square watermelons, the girlfriend pillow, and tomato chocolate bars. And in case those aren’t enough to send you out for airline tickets to Tokyo, I have just found another draw. 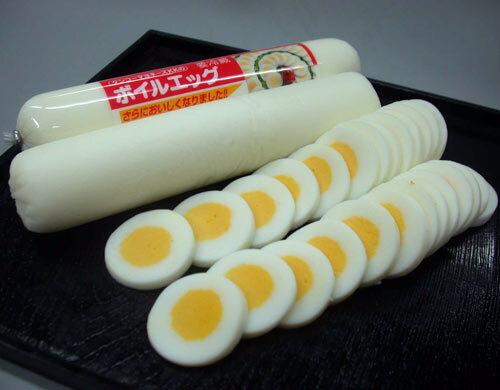 The Japanese egg roll. How efficient is this? Instead of taking the time to boil an egg and set the timer to ensure it’s hard-boiled, you simply take out your tube of egg and hack off a slice or two. I wonder what type of bird lays cylindrical eggs?